Measuring 3.27 x 7.8 x 3.27 inches (83 x 198 x 83mm; W x D x H) when folded up, the Mavic Pro looks downright adorable and has nearly the same size as a water bottle. DJI has also come up with a new ultralight and aerodynamic airframe that weighs only 743g. Compared to DJI’s past drones, it’s teeny at half the size and weight of the company’s flagship Phantom 4. The Mavic Pro is the first DJI drone small enough to be thrown into a backpack or purse rather than a special hard pack specifically designed for it. This is all thanks to a new folding design in which the two front arms swing back while the rear limbs flip down and towards the quadcopter’s main body. Despite rotors being attached to articulating elements, the Mavic Pro feels solid. It takes a fair bit of force to position everything, but not enough to stop you from getting it setup in a minute. With most devices, going smaller usually means cutting features, but that couldn’t be more wrong with the Mavic Pro. It still comes equipped with all the features of DJI’s larger drones, including front- and bottom-mounted sensors, built-in obstacle avoidance, subject tracking, self-piloted return landings and geofencing to help keep it out of restricted air zones. If anything, users lose a tiny bit of speed by going with this smaller drone. The Mavic Pro can achieve a maximum speed of 40mph (65kph) in sport mode – a special setting for drone racing, if you want to cut your teeth at the burgeoning sport – while the Phantom 4 can hit a 45mph (72kph) top speed. DJI’s newest drone is also designed to fly steadily, even in the face of 24mph (39kph) winds. As for range, you’ll be able to stay connected to the quadcopter up to 4.3 miles (7km) away and a single charge gives you up to 27 minutes of flight time. 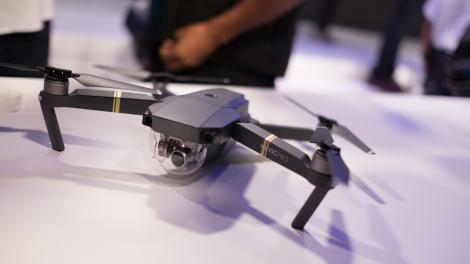 Unlike the GoPro Karma, the Mavic Pro comes with a camera, but you can’t take it off for non-airborne adventures due to a non-removeable gimbal. That said, the camera can record 4K video at 30fps or 1080p footage at 96fps – the latter of which it can also live stream to Facebook, YouTube and Periscope at a slower 30fps rate. Alternatively, users could snap 12MP image stills in Adobe’s DNG RAW format. Users will also be able to take two-second long exposures. While DJI is confident its new three-axis gimbal will produce sharp results, we’ll have to put this to the test in the wild with our full review. On top of stabilizing recordings, they gimbal is also designed to turn the camera 90-degrees for portraits and capturing tall architecture. In terms of optics, the camera can capture a 78.8-degree field of view and focus as closely as 19-inches (19cm). Ultimately, the greatest barrier to entry with drones has been intimidating controls, and DJI is trying to change that with a simpler and just-as pocketable solution. The optional remote control is also made with a similar folding design in which the two top-mounted antennas flip up while the bottom half of the controller splits to reveal a smartphone clamp. While there’s a screen built into the controller, it only displays telemetry data such as altitude, orientation, speed and distance. To actually see though the drone’s eye, you’ll need to connect a mobile phone. Thankfully, the picture looks clearer. Alternatively, the drone maker also introduced a new DJI Goggles headset that displays an 85-degree view from the drone on a 1080p display. We got a few seconds to try on the headset and we were amazed with the clarity and lag-free quality of the picture. It’s an immersive experience, to be sure, but one most users likely won’t need unless they’re racing the drone in the aforementioned sports mode. Overall the controls feel good, especially with a set of premium metal joysticks rather than the plastic nubs we’ve seen on other drone controllers. Though there are numerous sets of buttons, we weren’t intimated as everything was clearly marked, including controls for taking photos and return landings. And if that’s still too much for you, DJI has beefed up the mobile controls on smartphones. Going app-only with the Mavic Pro allows users to simply tap on a location for the drone to fly to. Uses can also tell the drone to fly forward while it avoids obstacles on its own. The Mavic Pro is also the first DJI drone you can control with gestures alone. It’s a surprisingly robust mode that allows you to wave your hands to get the drone’s attention. From there, you could make a “Y” with your arms to tell the quadcopter to focus on you, or, if you mimic a photo frame with your fingers, the drone will take an aerial selfie. Beyond these neat commands, you can also orchestrate the drone’s flight with your hands. Gesture in a direction and the drone will follow suit. Likewise, if you have the drone focus on you, it will also follow you as you move – from a generous distance, that is. On paper, the Mavic Pro seems like DJI’s most accessible drone yet. It’s priced right, and compared to the GoPro Karma, it’s also more affordable with an included camera, no less. Between the improved smartphone app and gesture controls, DJI has made a drone that’s much easier to control for the less technically minded. Mavic Pro should appeal to those who have been watching drone footage by the wayside and are itching to make their own. DJI has finally done away with two of the biggest turn offs of drones by making a device that’s far more portable and easier to control.